Lenovo has a flexible and foldable laptop in the pipeline, at least if a freshly discovered patent turns out to be on the money. 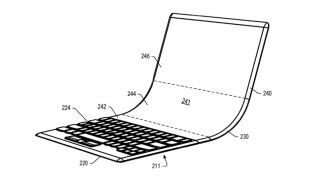 The patent (spotted by Windows Latest) has just been published by the US Patent and Trademark Office, and points to a foldable notebook (running Windows 10) with a screen portion (OLED technology is mentioned) and a keyboard portion. It looks like Lenovo is mulling a ‘watchband type of fold region’ when it comes to the hinge for the device (see the below image), but the clever bit is that the screen will extend into the keyboard base portion. In other words, the display will extend down into the keyboard section to give the user a greater amount of screen real-estate. And this may also facilitate a strip of icons at the bottom of the screen (or the top of the keyboard, rather), in a similar vein to the Touch Bar on Apple’s MacBooks. It’s certainly an interesting concept for a device, in terms of maximizing the screen space available on a notebook, without going the whole hog and losing the physical keyboard. Although it’s easy to imagine that this concept could be developed further to one giant foldable screen, offering the user a virtual keyboard (dispensing with the need for any hinge). As ever, Lenovo might just be tinkering with this idea in its research labs, and we may never see a foldable laptop along these lines. But foldable technology is certainly becoming a more and more popular idea these days – we’ve recently spotted the likes of the Samsung Galaxy X and Royole FlexPai (although those are phones rather than tablets or 2-in-1s). Other firms are looking to the dual-screen tablet concept, rather than having anything foldable, though, like Microsoft with its Surface Centaurus. Whatever the case, you can bet that the world of portable computing devices will undergo some serious transitions in terms of form-factor and flexibility in the near future, and seeing exactly where things will go is an exciting prospect.